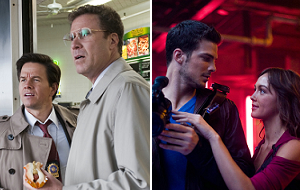 The Other Guys and Step Up 3D enter the summer frame. Thursday Update: The Other Guys 3,651 (new); Step Up 3D 2,435 (new); Inception 3,418 (-127); Dinner for Schmucks 3,004 (+93); Cats & Dogs: The Revenge of Kitty Galore 3,705 (0); Despicable Me 3,411 (-191); Salt 3,317 (-295); Charlie St. Cloud 2,725 (+7); Grown Ups 1,769 (-500); The Kids Are All Right 994 (+147). Wednesday Update: A cop comedy with one of the best ensemble casts of the summer looks poised to finally end Inception's three-weekend run in first place. The Other Guys finds Will Ferrell and Mark Wahlberg being supported by Samuel L. Jackson, Dwayne Johnson, Eva Mendes and Michael Keaton in the latest effort from comedic helmer Adam McKay (Step Brothers). After some recent disappointments, both Ferrell and Wahlberg are in need of hit. They'll get one here. The Other Guys boasts an infectious trailer, and Sony is not skimping on the marketing blitz. The studio is obviously confident in what they have to offer. According to the most recent WebWatch report, The Other Guys represents a weak 3.54% market share of online opinions. The R-rated comedy is likely to join Couples Retreat and Grown Ups as a film that opened well despite failing to generate a lot of online buzz before hitting theaters. The Other Guys has a very healthy following on Facebook with more than 200,000 fans. To put that into perspective, Grown Ups had around 140,000 on the day of its release. The impressive fan count is a sign that Sony has successfully mobilized the fan base. On Twitter, The Other Guys has been outpacing Couples Retreat, Grown Ups and Dinner for Schmucks this week. "The Other Guys looks incredibly similar to Grown Ups, though with a more pronounced skew toward male audiences, who are more than twice as interested as females," says Flixster spokesperson John Singh when discussing activity on the website. As of 3 p.m. PT, Fandango.com is reporting that The Other Guys hasn't made its way into the top five daily sales list. That's not necessarily something to worry about, since Grown Ups was unable to break into the top 5 on the Wednesday before it hit theaters. Granted, the Adam Sandler vehicle was competing with two strong online sellers: Toy Story 3 and The Twilight Saga: Eclipse. Look for The Other Guys to rake in a healthy $38 million from 3,400 theaters during its debut frame. The major benefit of the Step Up franchise is that the cast of each film always consists of relative unknowns, and therefore the budget stays reasonable. That means the third installment doesn't have to hit blockbuster levels to be profitable. Since Step Up 3D is aimed primarily at teenage girls, its online activity is very strong. With a 10.82% market share of opinions, the dance movie ranks behind only Scott Pilgrim vs. the World among unreleased films. More than 1.2 million fans are showing their support for the Step Up franchise's Facebook page. However, this summer has shown that films aimed at female moviegoers tend to have strong followings on Facebook, but that doesn't necessarily translate to box office success. Just last weekend, Charlie St. Cloud opened to $12.4 million despite the fact that it had more than 785,000 fans on the day of its release. On Twitter, Step Up 3D is outpacing Charlie St. Cloud, Remember Me and Dear John. As of 3 p.m. PT, Fandango is reporting that Step Up 3D hasn't cracked the top five sellers list. That's likely to change on Thursday. Expect Step Up 3D to bring in $19 million from 2,200 locations. Inception will still have a great weekend. Christopher Nolan's mind-bender holds a 13.78% market share of online opinions among unreleased films, which shows that conversations about the film are still raging. Cats & Dogs: The Revenge of Kitty Galore Jul 30, 2010 Warner Bros.